In the same way that it’s best to work with a professional graphical designer on the icons and images in your app, it’s best to work with a professional writer on your app’s user-visible text. A skilled writer can help you develop a style of expression that reflects your app’s design, and can apply that style consistently throughout your app. Since November 2013, I’ve been working with many of the original team behind Skype to launch a new secure messenger called Wire. Text appears in the user interface (or “UI”) in button names, menu labels, application settings, and dialogs as well as the “microcopy” in notification banners, headings and small print, navigation, feedback and error messages. 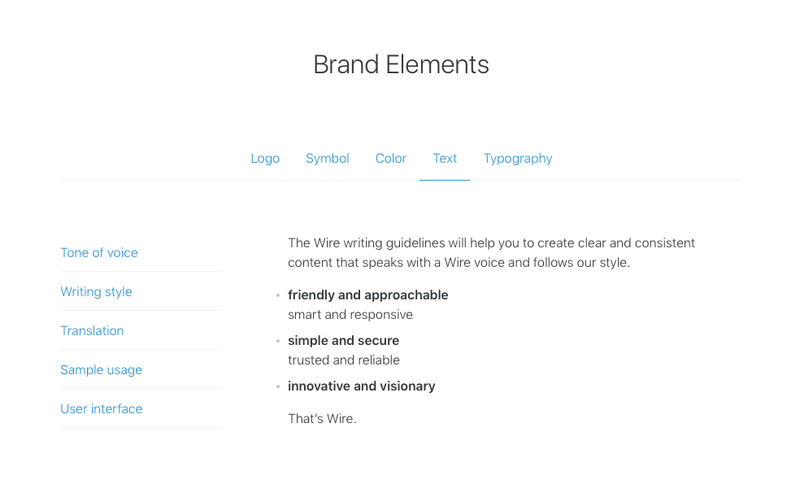 I also maintain the Wire writing guidelines to help authors create clear and consistent content that speaks with a Wire voice and follows house style.